Court proceedings were adjourned on Monday as murder-accused Oscar Pretorius lost his composure in the dock while evidence from an autopsy on Reeva Steenkamp was being heard. Court proceedings were adjourned on Monday as murder-accused Oscar Pistorius lost his composure in the dock while evidence from an autopsy on Reeva Steenkamp was being heard. He closed his ears with tissues and gagging noises were heard from the dock as pathologist Gert Saayman was giving graphic evidence of the wounds Steenkamp suffered when Pistorius shot her dead. The paralympian burrowed his head down as Saayman testified. His lawyer, Barry Roux, SC, called for an adjournment, which was granted. His brother Carl and his sister Aimee came over to the dock to comfort the distraught Pistorius during the adjournment. Saayman was going through graphic photographs of Steenkamp, explaining the blood-stained clothes that were brought in with her for him to conduct an autopsy on. Pistorius has been charged with the premeditated murder of Steenkamp and to charges of contravening the Firearms Act. He contends that he mistook Steenkamp for an intruder when he shot her, and has pleaded not guilty to all the charges. 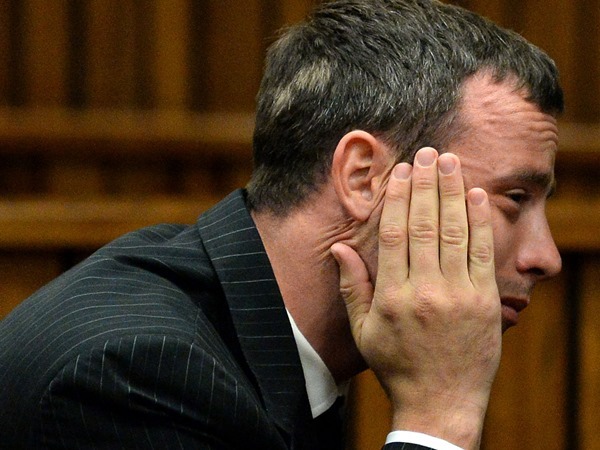 Pistorius has denied that he and Steenkamp argued earlier on the night of the shooting.